Your business needs faster, more nimble IT operations. As software and the cloud make your enterprise more agile, is your network responsive? The enterprise network must be secure, transparent and flexible enough for total control. It must be smart enough to detect and resolve issues proactively. Join us and Ovum for a webinar that shows how an intelligent, software-driven network delivers deep converged features for visibility, control, insights and actionable intelligence. - What digital transformation means to business operations, and why the network plays such an important part. - Enterprises’ priority network challenges and requirements. - What an agile, unified networking platform should look like, and the benefits to enterprise. Digital transformation improves the performance and reach of a business. Today, organisations are capitalising on new technologies to improve business agility and growth. The emergence of the Software-Defined Network services can deliver critical benefits that help to boost your business but this may come with a whole suite of complexities. Attend this webinar to learn how to simplify your network deployment and management. Behind the IoT is Singtel’s secure and reliable network that helps your business harness the full potential of the IoT. Enterprise applications and business processes are enabled by ICT solutions deployed within the data centre facility, while reliable connectivity unifies all your presence across different geographies. Meanwhile, let’s not forget the increasing reliance of cloud services that helps enterprises to reduce capital expenses and increases agility. Sounds like a disparate, complex environment? Well, it is. In this session, Ashton Soh, Associate Director of Managed Hosting in Singtel, will lend insights how Singtel’s DC.DX platform, with the data centre at the heart of it, can help enterprises mitigate the complexity and gain the right expertise for their digital transformation initiatives. To further enhance the cyber resilience of the banking sector in Hong Kong, the Hong Kong Monetary Authority launched the Cybersecurity Fortification Initiative. Learn more about what it is through experts in the field. A fast-evolving and increasingly virulent threat environment are raising the security stakes for businesses today – gain insights into why the required considerations of IT/OT security are imperative in any digital transformation journey. Cyberattacks are getting more sophisticated, using a combination of strategies to penetrate the organisation and often for financial gain. Tune in to hear from Singtel's Abdullah Sheikh and Trustwave SpiderLabs researcher Thanassis Diogos as they describe the latest multi-vector attacks uncovered just recently in the financial industry, a modern ‘bank heist’ that uses technical and non-technical methods, with potential to expand across the globe. The webinar will show you the steps taken by this criminal network and how easy it was for them to divert on average USD$5 million in cash for every target they reached. Understand what measures our experts recommend to ensure your organisation doesn’t become a victim of a similar attack in 2018. Learn more about how you can harness the power of cyber threat intelligence to protect your organisation against cyber-attacks. Singtel Managed Cloud is an Infrastructure-as-a-Service (IaaS) offering that helps you leverage IT adoption to grow your business, without the hassle and cost of having to run your own complex IT systems. Singtel Network Function Virtualisation (NFV) uses software to virtualise network services, such as routers and firewalls, so that it can be managed from a secure web portal anytime, anywhere. 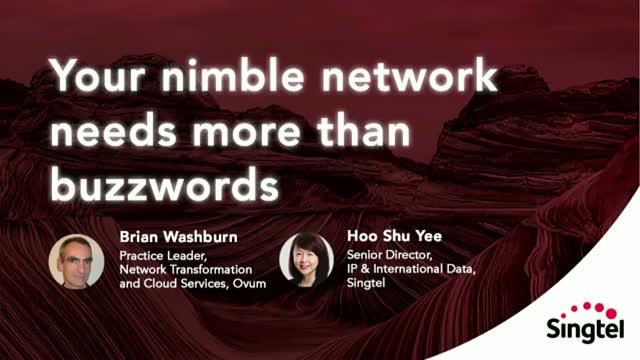 With network equipment hosted on Singtel’s cloud, businesses can reduce physical networking costs and deployment time, increasing the control they have over network services. Businesses operating in multiple sites can minimise trips for on-site support of IT equipment as network administration can be remotely accessed through a web portal. Experienced technical experts and qualified NFV partners are available for after sales support and businesses can enjoy maximum uptime with service availability assurance. As more employees use their devices to access cloud applications, enterprises are faced with new connectivity, latency and security challenges. Singtel Managed Hybrid Network helps businesses address this by combining high-performing multi-protocol label switching (MPLS) networks for business-critical applications and cost-effective internet links for less important connectivity needs. Now, they have the ability to connect employees to cloud-based business systems using their mobile devices anytime, anywhere. Contrary to popular belief, spending millions of dollars a year on your organization’s cyber security program does not guarantee protection against all potential risks. From processes and technology, to the people you have invested in, how do you know if they are effective? In order to proactively mitigate risk, you need automated tools that continuously measure and monitor your security performance. You will then also be able to assess performance against industry peers and competitors. Hoo Shu Yee, Product Dir, Singtel & Ramesh Prabagaran, VP, Viptela,Inc. With APAC’s varying stages of infrastructure development, managing an enterprise Wide Area Network (WAN) in the region can be extremely challenging. This is compounded by different networking standards and service level agreements (SLAs) across countries, as well as disparities in race and culture. Furthermore, as more applications move onto the cloud and employees become more mobile, enterprises have to deal with growing risk of cyber attacks with increasingly complex WAN environments that combine multiple private networks and public internet services. Lastly, find out how Singtel ConnectPlus SD-WAN service powered by Viptela, designed with security in mind, can help to simplify and unify your networks, while providing protection against data breaches and attacks. Our network is present in over 80 cities worldwide, from key cities to regulated emerging markets in Asia Pacific, Europe, Middle East, Africa and the Americas. Software-Defined WAN, enterprises can simplify and securely manage different networks as if they are one. It enables businesses to take full advantage of hybrid networks through a centralised management console hosted on Singtel cloud. Across the globe, Singtel is focused on delivering innovative and relevant IT enterprise solutions that give businesses the winning edge in a constantly evolving landscape. We provide Network Services,Cyber Security Solutions, Data Centre and Cloud Hosting Services, Unified Communications to enable a seamless experience for your corporation. Coupled with a robust global network IT infrastructure, managed services, and a team of professionals with deep local and regional knowledge, you can focus on growing in Asia faster and more cost-effectively.